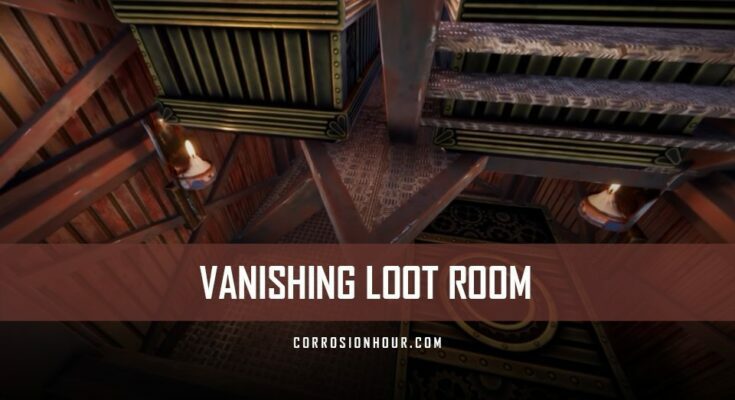 This video, Vanishing Loot, was created by our content partner Evil Wurst. The un-lootable loot room design was a major trend in RUST. This allowed players to set up convenient loot rooms that did not require advanced doors or blueprints to protect them. When boxes were destroyed by raiders, the loot would be inaccessible. The half wall and short wall would stop players from being able to reach the loot pouch, requiring additional explosives to destroy these walls. It was a no-brainer technique to use in RUST base designs. This technique, however, came to an end with the Electric Anniversary update, in which new changes were put into place around how loot drops from boxes. Loot boxes would now drop the loot pouch at the last location where damage was received, allowing players to access the pouch through the half & short wall defense. This effectively killed the unlootable loot room design. It wasn’t long after this that new experimental techniques were being created to combat these changes. The most effective of them is the vanishing loot room design, in which the loot will fall out of range and visibility of the raiders. Pay special attention to Evil Wurst’s walkthrough, the loot boxes must be set up just right for this technique to work in favor of the base owner! Be sure to browse Evil Wurst’s past videos and don’t forget to subscribe to his channel to receive notifications on his latest videos. Look at that, a box full of juicy loot. Code locked though. My friendly base builder Twisited has kindly for a test raid. So just to be clear he upper ones or the bottom ones? The bottom ones, the upper ones. In early 2018, Twisited introduced us to so-called un-lootable loot rooms. The main idea behind this design is to place code lock boxes behind some impassible gap such as low walls or a window blocked by a floor tile. If the boxes are destroyed, the stashes that contain the loot used to drop out of range. This forced raiders to go through a wall to get to the loot, which can be beyond their means if the wall is upgraded to sheet metal or armored. I understand that not everyone is a fan of these un-lootable designs, but sometimes it can be a relief to know that your hard earned gunpowder de-spawned, rather than falling into the hand of these toxic neighbors that raided you. However, in December 2018, Facepunch released a fix, stating that storage boxes drop their item at the last position they took damage in. I suppose the intention was that if raiders hit the box at the right spot, the stash will drop within range and then can be looted through the gap. I’m not sure if you have already realized that, but to my surprise, this is not how the fix actually works. Let me demonstrate. In fact, it seems that the stash drops close to the person destroying the box, rather than the location where the damage occurs. Anyway, un-lootable is so 2018. How about vanishing loot? As you can see, the loot stash is gone. No tricks. So where did it go? The stash clipped through the wall and now lies in this compartment below the radar. The behavior was discovered by Navyblue. The core ingredients are a half-wall which needs to be sheet metal with the soft side facing the inside of the loot room, a box placed as close as possible to the half-wall, and an obstacle that prevents raiders from entering the loot room. If now the box gets destroyed, loot stash clips through the wall, vanishing from the eyes of the raiders. So let’s build an example loot room using this vanishing loot technique. Build a square foundation with half-walls on each side, soft side facing inwards. Surrounded with triangles and at half-walls on the outside as well, and close them off with floor tiles. Now put on two code lock boxes. Getting the placement right is very important, otherwise the stashes might get stuck between the beams of the metal wall instead of clipping through it. Find the line on the center of the metal foundation. I got the best results if the box was about two to three of those dots away from the center line. Once you’ve got the box aligned with those dots, push it as close as possible against the wall to the side. Next, place a triangle floor above them to prevent raiders from placing sleeping bags. In this case, we’re going to use the rest of the space to fit four additional boxes. To prevent raiders from walking into the room, place l-shaped stairs, with the upper side facing the front of the loot room. Finally we close up the room with the doorway. Together with the stairs, the entrance is locked and the loot room cannot be entered anymore. Let’s put this to a test. And… the loot has vanished. We stress tested the design, and already found a few weaknesses, but none yet that breaks the concept. First of all you can grab the loot stash by spamming E when destroying the box. If the stash clips through the wall, raiders will only see the content briefly. However, in some cases, the loot stash may not fully clip through the wall, but get stuck on one of the beams. In this case, spamming E allows to retrieve the loot. Second, the fact that the loot stash falls towards the raider dealing damage can be exploited as well. Zetche proposed that clever raiders could throw an explosive, run to the side of the loot room, and thereby force the stashes to drop towards that side. This means the stashes will be visible inside the loot room. The good news is, they still fall out of reach, so raiders will have to spend more explosives to retrieve them. In our tests, the glitch worked and we haven’t yet found a way to reliably break it. If it stays that way, imagine the possibilities. Imagine raiders who are not aware of this design. They must believe that the box was empty and simply walk away at this point. You can even play mind games with raiders who are aware of this design, and leave the two lower boxes empty, forcing raiders to blow into a sealed compartment just to find nothing. Or imagine if you actually could sit on the other side of the low wall and collect the loot during an online raid without even getting noticed. Let me know in the comments what you think. How would you use this design? How would you try to break it? If you make a video on how to use or how to break this vanishing loot design, please link it in your comment. I will go through all the links and collect the best ones in the pinned comments so everyone can easily find them. Vanishing loot. Looking forward to what you can come up with. Until then, Evil Wurst out.